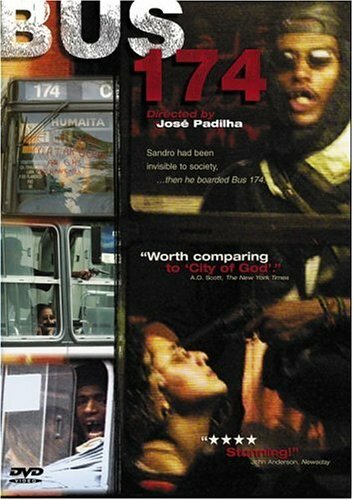 BUS 174 is a careful investigation of the hijack of a bus in Rio, based on an extensive research of stock footage, interviews and official documents. The hijack took place in June 12, 2000 (Valentines day in Brazil) and was broadcast live for 4 and a half hours. The whole country stopped to watch the drama on TV. The film tells 2 parallel stories. Not only does it explain the dramatic events that unfolded as the police tried, and failed, to handle the hijack situation; but it also tells the amazing life story of the hijacker, revealing how a typical Rio de Janeiro street kid was transformed into a violent criminal because society systematically denied him any kind of social existence. Both stories are interwoven in a such a way that they end up explaining why Brazil, and other countries with similar social and economic problems, are so violent.